The UK Industrial Vision Association (UKIVA) has two new members: Spiral Scratch and Scorpion Vision. The Vision 2007 event saw 16 per cent more visitors and 31 per cent more exhibitors, compared with last year's stats, when the trade fair ran in Stuttgart from 6 to 8 November 2007. Goodrich is to develop night vision sensors for the US Defense Advanced Projects Agency's unmanned aerial vehicles. Firstsight Vision has sponsored an expedition to Antarctica to create an education base that will provide live transmissions over the internet. 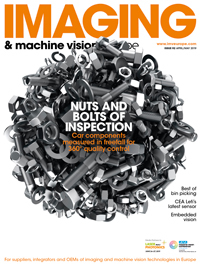 After a period of rapid growth, the European Machine Vision Association (EMVA) now includes more than 100 members. The 100th organisation to join the association was NeuroCheck. MVTec Software has launched an official partner programme to strengthen its relationship with suppliers of image acquisition equipment. Michelson Diagnostics has appointed a new finance director and a new head of marketing; Imperx has appointed five new systems developers; and Pryor Marking Technology has rearranged its management structure. i2S Linescan will be bolstering its presence on the Chinese market with a larger facility in Shanghai. The UK Industrial Vision Association (UKIVA) is to run a series of free seminars at the IPOT/MV 08 exhibition, 13-14 February, 2008 in Birmingham, UK. The EMVA has released a list of 1288 Standard-compliant products with downloadable datasheets.